Many chefs swear by buttermilk. Others say the secret is lard. A light and fluffy biscuit is one of the most iconic Southern delicacies. Whether they’re prepared to be sweet or savory, served with jam, honey, or gravy, biscuits are a staple comfort food. “They know no socioeconomic level and they speak to all cultures,” Carrie Morey, owner of the iconic Charleston, South Carolina-based Callie’s Biscuits bakeshop, told TODAY Food. Morey will be showcasing her skills at the upcoming Charleston Wine + Food festival in March — but she shared some of her favorite tips. 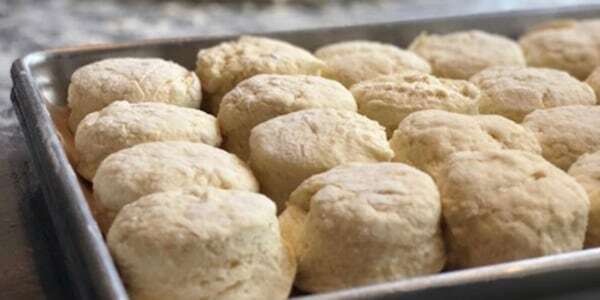 While many Southerners grew up eating biscuits, people across different regions still debate about what ingredients absolutely must be included in a classic biscuit recipe. The word biscuit literally means “twice cooked,” a la an Italian biscotti. “Most southerners today will argue about the ingredients, relying on what they grew up with, whether the biscuits were grandma’s or [from] Hardee’s,” food historian John Taylor told TODAY, noting that fast food biscuits have been around nearly 50 years. The history of the Southern biscuit dates back to the early 19th century, when beaten biscuits first appeared. Before the leavening agent baking soda was created, biscuits were really hardtack (also known as "sea biscuits" due to their ability to withstand long voyages), made simply with flour, water and sometimes salt. “The ‘leavening’ was achieved by beating the dough repeatedly until it blistered,” said Taylor, who added that enslaved people in the South likely contributed to the endurance of the favored treat on the Middle Atlantic seaboard, using manpower to make the biscuits by hand. Hardtack and sea biscuits were antecedents of today’s fluffy biscuit. Today, “all have flour, salt, lard — or another fat — and a liquid,” said Taylor. Thanks to the invention of baking soda in the 1840s and the improved productivity of flour mills by the mid nineteenth century, biscuits and other breads evolved. Cooks were also freed from needing to adhere to longer baking times. Southerners then began creating their own spins on the biscuit. Some say the technique makes more of a difference than the ingredients, while others argue it's all about what goes into the mixing bowl. Using one’s hands is much gentler on the dough and a machine can change the weight, texture and feel of a biscuit, said Morey. Morey's recipe was passed down from her mother, who learned it from Morey's grandmother. Once a baker gets the hang of making biscuits by hand, then they can get creative. “People get hung up on recipes, but biscuits break all of the science baking rules. You don’t have to use specific measurements. How does it feel? You don’t need to measure exact ingredients. The texture can change greatly on the weather [or] where you’re making them,” said Morey. Chef Kevin Johnson of The Grocery advises novice cooks to practice good techniques combined with quality ingredients. “Be gentle! You're not making bread here,” Johnson told TODAY. “You want to barely pull the ingredients together and not overwork the dough." Pastry chef Katy Keefe at McCrady's and McCrady's Tavern in Charleston, believes in the secret power of two ingredients: “Self-rising flour is the best and a really good buttermilk," she told TODAY. Another hot tip? Use a hot oven. Keef suggests baking biscuits at 425 degrees. “It bakes them really quickly and keeps all the butter inside, which gives you that beautiful, soft crumb." Morey is a big advocate of experimentation. While she was growing up, Morey's family used lard with bacon drippings, because butter was too expensive. But any biscuit recipe still goes back to the basics. “Always use a great Southern flour, fat and a liquid. Today, we use whole buttermilk from a local farm,” said Morey. Want to join TODAY at Charleston Wine + Food in March? Enter for a chance to win a trip here!